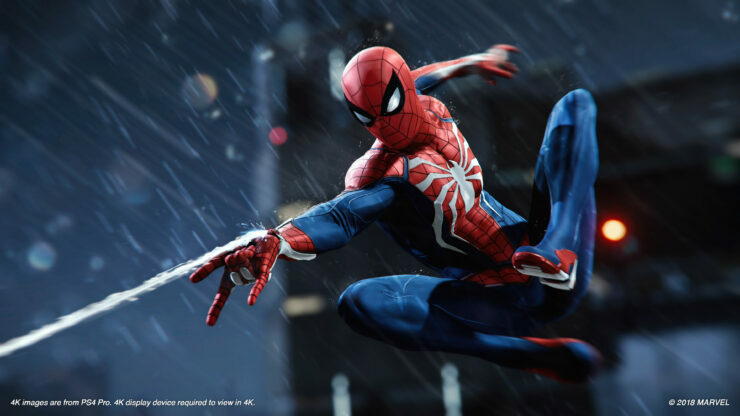 As usual with basically every major game release since Watch_Dogs back in 2014, a ‘graphics downgrade’ debate sparked on the Web surrounding Marvel’s Spider-Man, the PlayStation 4 exclusive due on September 7th worldwide, with a few fans inquiring with Insomniac and Community Director James Stevenson about these graphics changes. According to Stevenson, who spoke with his engineers and artists colleagues at Insomniac before addressing the fans in the following series of tweets, the reason for these graphics changes is to be found in a combination of art changes (such as the reduced number of puddles in that scene and the different lighting due to the Sun’s position having been moved around) and “aggressive” video compression resulting in crushed detail for that video. However, no actual level of detail has been diminished – thus, no downgrade at all in the final build. Stevenson invited skeptics to check out the 75 minutes of gameplay (based on the E3 2018 demo Nathan played in LA and wrote about) posted earlier this Summer by Insomniac to confirm that the game still looks as good as it did when it was first revealed. He then vehemently rejected any comparison with Watch_Dogs, to this day considered the greatest examples of a graphics downgrade, saying that examples from that game are like ‘night and day’ compared to these small changes. I'm telling you the lighting (darker lighting hides dark details), combined with compression crushing dark detail, is making it appear less detailed in the tiny screenshots going around, but it's NOT. I said the puddles being removed was an art change, not a technical one. We’ll soon have the game in our hands, anyway, and be able to judge ourselves. The review embargo has been set by Sony for September 4th, three days ahead of the public release, which bodes well for the confidence both the publisher and the developer have in the game’s quality. Spider-Man will last about twenty hours for the main story, as recently confirmed by Stevenson himself, though the length can significantly increase once side quests and side activities available throughout Manhattan are added into the count.